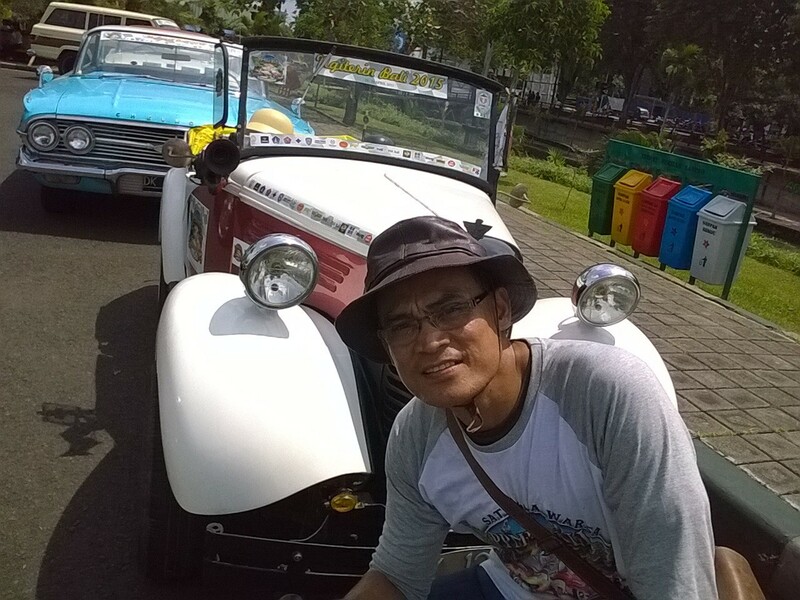 Trips – "da Trooper Bali"
As the time run so fast and the sun also start going down to the west horizon, by 16.03 we decided back to the Dream Beach our bungalow in Dream Beach and get shower to refresh our body and soul. We back to our accommodation by 16.15. We explore the Blue Lagoon Point and take some picture in some location. We spent our time about 2 hours in Blue Lagoon Jump Clift. Please enjoy the picture. Dream Beach, located nearly closed to the DayDream Bungalow where we stay. But we must ride a motorbike to go there, as take about 10 to 15 minutes if we went there by walk. 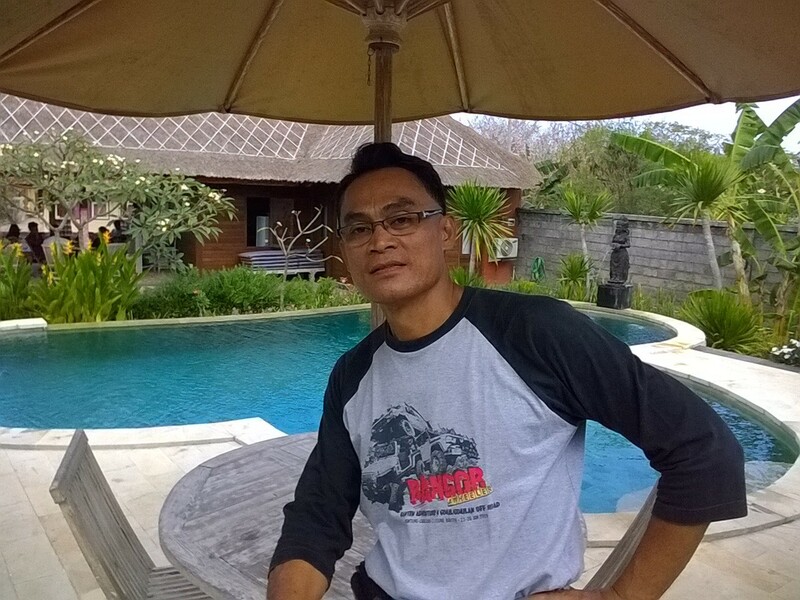 According to Komang the guy in DayDream Bungalow, the sunset time within 17.35 to 8.00 local time. 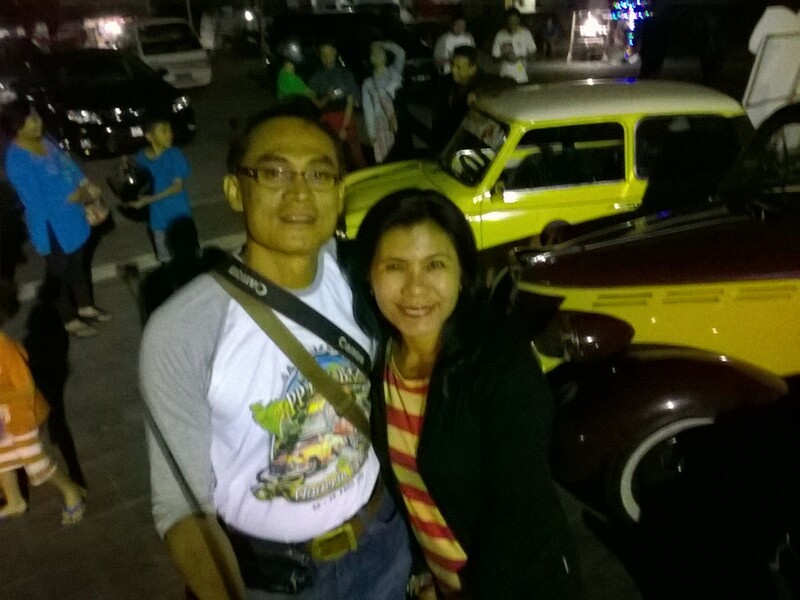 So I take motorbike and ride with my wife going to the beach. The beach in Dream Beach is full of rock stone. The beach it is not for swim as the sea level deep. It’s about 3 to 5 meters down to the rock stone, with some wild grass around. It is only to see a view and panorama. We arrive in the beach about 17.40 but unfortunately, the sky was not so bright. It is cloudy. The sun almost down in the horizon, but we could not see the sun clearly as the cloudy wrapping around. The horizon seem red terracotta with the line bordered between the sea and the sky. It’s beautiful still. 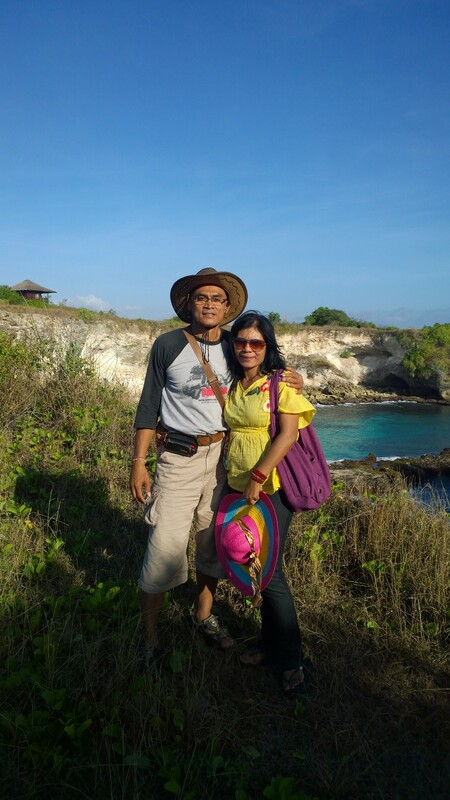 I and my wife relaxing and sight seeing to enjoy the panorama of the Dream Beach and it’s situation. There are also many people from oversea enjoy the sunset. Most of them are seem from China and Korea, but I meet many teen’s girl group also enjoying the sunset. They took a picture in group and individual in exstacy as it’s their time to do so as like my daughter did with her girl friends and classmate. Suddenly, I surprising by a pick up running quiet fast which bring many chinesse guests which seem also wants to see the sunset, but they are too late. The sun already down and left the red color in the west horizon, and in addition a cloud wrapping the sun, so we could not see the sun clearly. I take some pictures of my wife and of course myself for my documentation. 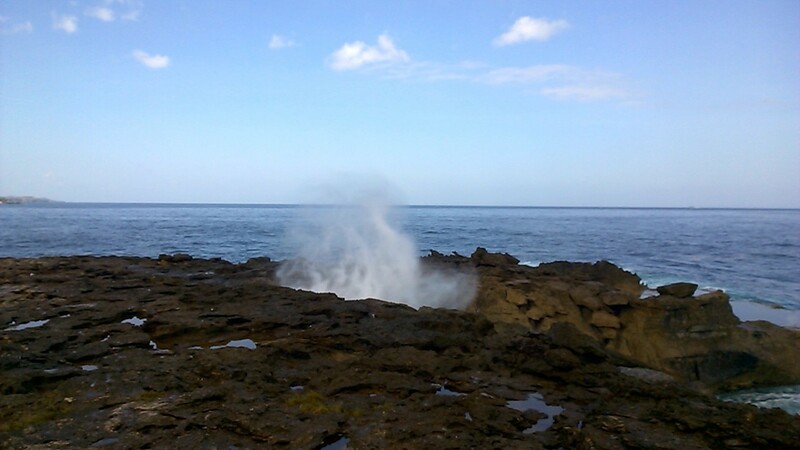 Picture in the rock side with the sea back ground seem pretty beautiful. I spent the time quiet lot and just back to the bungalow after the dark time came at 18.45. The light are on and in the dark, seem like a raising stars around the island. We back to the bungalow to take a bath, as we plan to have a dinner in the Dream Beach Club Restaurant at Sandy Bay Beach which also only 5 minutes from our bungalow by walk. I work out a little bit in the verandah of the bungalow, just doing push up and sit up for about 20 minutes, to kill the time, while queing the shower room, I jump to the splash pool to cooled my body after almost full day sunbathing during sightseeing around the island. Feel pure fresh while playing in the pool for almost half an hour. It’s dark already and the only sea breeze and the sound of the tide wrapping the area. There is no motor or a car seem run around. It’s very nature with the sound of the night insect and the sea. It s a pleasure time for us to relax and enjoy the island. My wife call me and said that she and my daughter Dewinta are ready for dinner. So I went out from the pool and get into the room and go to the shower room. I turn on the water and surprise as the very hot water sprung from the hanging shower. I turn off the valve and watching carefully the valve knob. I though I was put a wrong position of the valve for a hot water which usually in red color. And I am sure that the valve position is on the right side for a cool water with the blue color. I turn on again and slowly and put may hand on the water and the water still in hot. Ha ha ha. Finally I realized that the valve is fixed in the wrong direction. The red for hot water, springing the cool water while the blue for cool water is with a hot water. This is an example. We must careful and learn from this case to avoid changing our holiday become a night mare. I am showering my body in a hurry, as my wife remind me that my sister and her husband and their child is ready and un patient to have a dinner since they are in a heave hungry. Ha ha ha.. In 25 minutes I am ready for dinner. We are walking in the dark to Sandy Bay. Lucky me, I am always brought my mini light in my hand bang. I ask my family walking in front of me, while I directing the light in front of them as a guidance, so they can watch the way in the light. The restaurant located about 400 meters from our bungalow, we can see the lights of the Dream Beach Club Restaurant. It’s located in the beach. Named Sandy Bay. This restaurant has a splash pool as well which located in the seaside. In front of the pool are the beach with white sand and If we see around there is only sea and the horizon with some time the light of plane in the sky passing the island. We greet by the young lady the staff of restaurant with white color of uniform. She asking how many people of us. 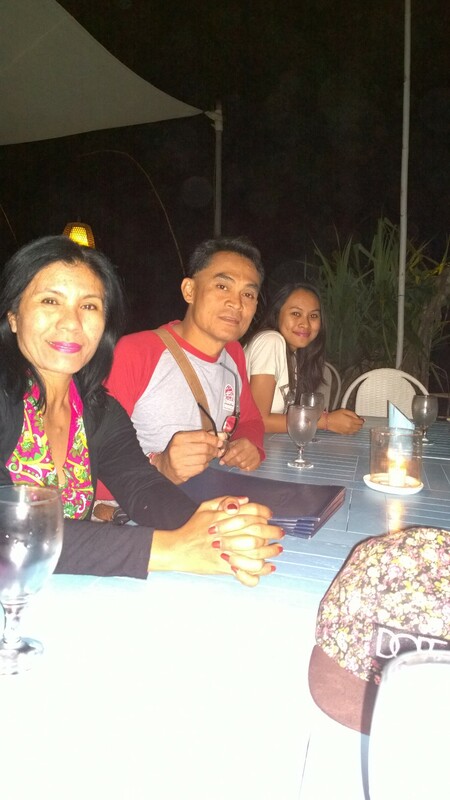 I explain that we are 7 people and she then host us to have a table in the middle of the area near to the beach side. A few second latter, a young lady seem like a Hispanic came over us and welcoming. She is a pretty women and seem a warm chic and energy women. She ask me where come from and how long will be in the island. I introduce myself and my family and asking where she from. She said, she is from Uruguay and her name is Patricia. After forward the menu list, she left us to welcoming and serve another guests. I ask her what is the special of the day in the resto and said their Chicken steak very popular and in a high demand. The special is the chicken steak with homemade sweet potato. Sound delicious. I am interesting. After forward the menu list, she left us to welcoming and serve another guests. I check the menu list and looking for the price. The price seem reasonable almost with same price like in Kuta, Jimbaran or Sanur. But, I will now after had the food and feel the taste of the food. Let’s wait…! I ask my sister and her family to choose the menu, while I order Chicken steak with homemade sweet potato, while my wife order regular chicken steak, while my daughter my sister daughter order Gordon blue chicken t. My sister and her husband only order fried noodle with seafood. The restaurant seem very busy and most of the guests are foreigner. Only us a local tourist. He he he. It is good for us to having a food in this kind of restaurant. 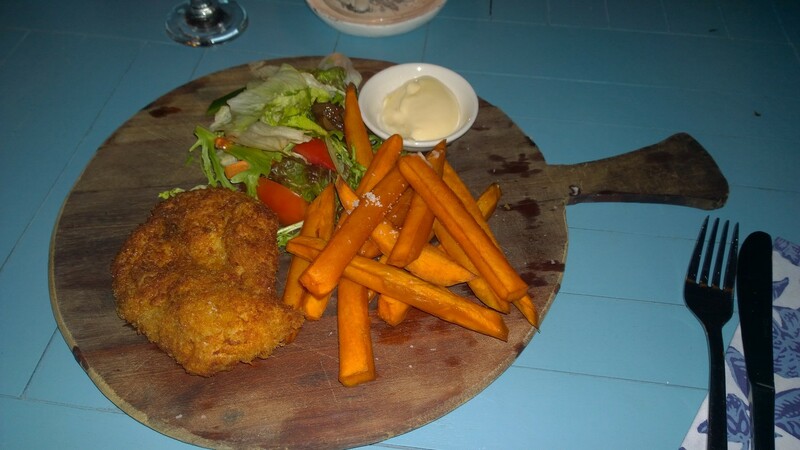 The restaurant is on the sand with the wood table and chairs just like Seafood grilled café’s in Jimbaran. The roof made from alang-alang and there also a tent with roof made from canvas fabric in white color. The ambience are good and homey for us. The staff are helpful and warm. After awaiting for about half an hour, our order came. Chicken steak set up in the wood plat with a handler, the ingredient is mixed vegetable salad with thousand island dressing, and the interesting one is the homemade sweet potato stick in red terracotta color like charrot. The portion quantity is big enough for me. I take one stick of the potato and bit it. Hmmm It’s yummy…! The taste like a regular potato’s but a slight different. After all of the orders completed, we had our meals while talking about the restaurant and the food we had. My daughter and my wife also take a stick of the sweet potato and the loves the taste. 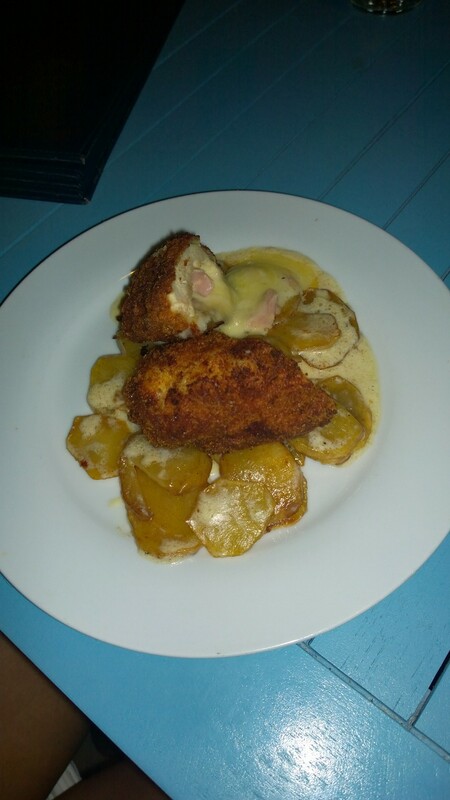 I tried the taste of the Gordon blue chicken steak and the taste almost the same like what we had in Denpasar. The taste of salad also not so different like what we had in Denpasar. Finally we finish our dinner at 21.30 and we happy and satisfied with the food and the services we experience in this restaurant. We back to the bungalow by walk and arrived on 2150. Since there is no television and other entertainment equipment in the room, we are go to the bed and sleep well. We woke up early in the morning. It is 5.30 in Lembongan Island. I open the curtain and look around, and the whether seem a slight cloudy. The grey in the sky, but the whether felt good. I came out from the room and sit on the long chairs in the poolside. Just relax and enjoy the whether. A few minutes after, my wife also woke up. I invite her to sightseeing to the beach to watching the sunrise, look around and enjoying the view and panorama of the Dream Bach. I take the motorbike and move to Dream Beach in a hurry, and see many people already there, most of them are busy with their camera, and there are a couple taking the picture. Seem they make pre wedding picture near the pandanuous trees. After a couple minutes, my daughter my young sister and her husband and their child also join with me to sightseeing. They take a pictures in many location. Mostly in the rock with the sea background. We playing in the beach until 10.50 and back to the bungalow for checkout process. 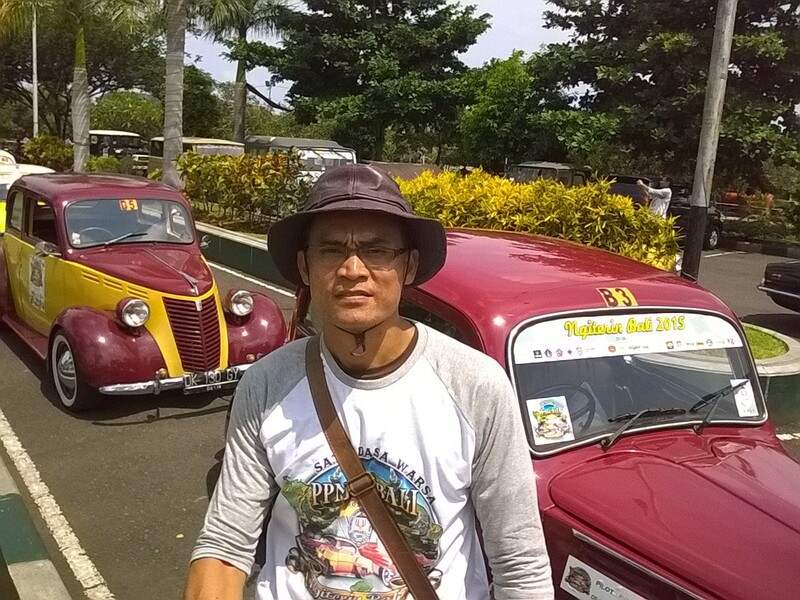 I am back again to continue my story adventure in Lembongan Island. Please enjoy…! The shower room design in open air, with hanging shower rain, dressing table with mirror and washbasin, while toilet bowl is set up in the behind of the dressing desk. 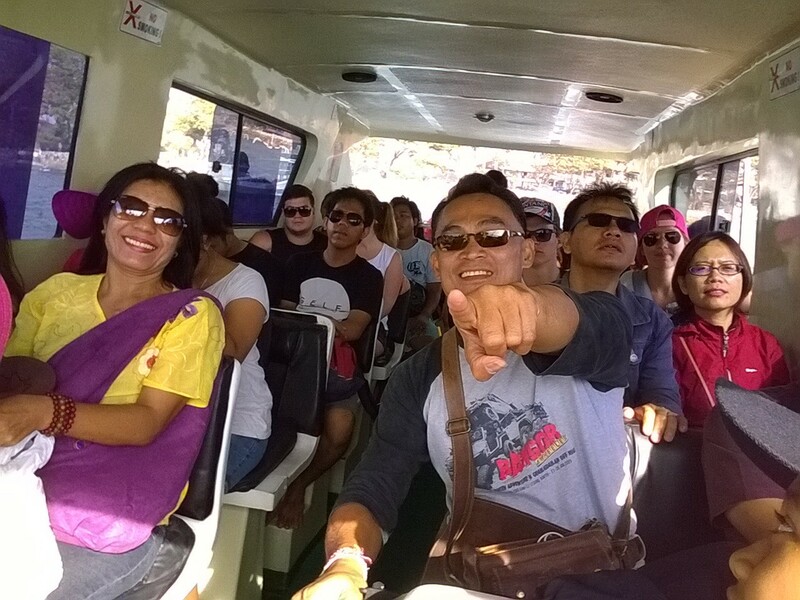 We put our belonging and prepare to sightseeing and exploring the island. By 11.23 local time, we checked in to the Bungalow, and after kept our belonging to the our rooms, we are ready to explore the island. 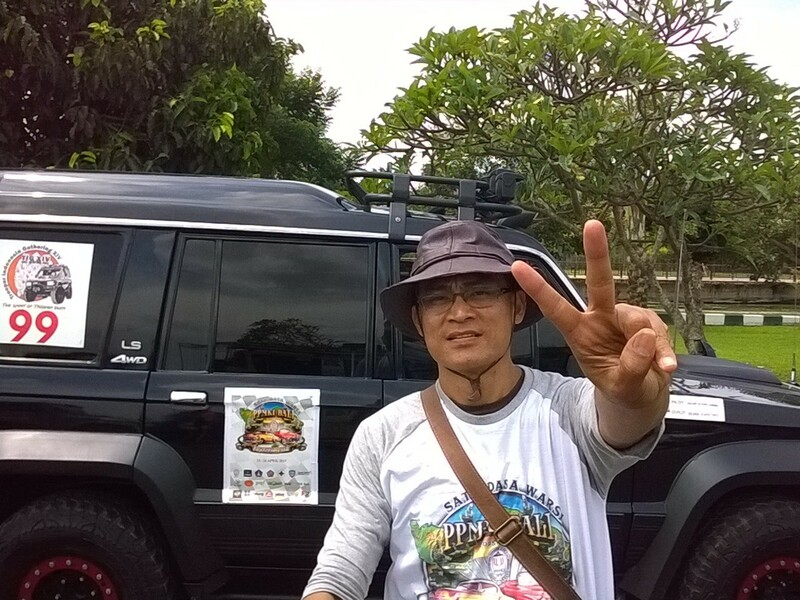 At first, as we have planned, we will visit the mangrove forest in Jungut Batu. We ready with scooter motorbike. I and my wife riding a Yamaha Mio Soul. The clock on my Nokia phone shown 11.35 Bali time. It is a lunch time already. And most of us quiet hungry, we must find something to eat. So we are looking a “warung” or pub to having lunch, but after looking for some places around, we did not found any “warung” or pub. There is only one good restaurant with an expensive price and one small warung available, while most of others are closed due to Galungan and Lebaran day. So after thinking and check our budget, we decided to have a “nasi goreng” at the only warung open. After discuss among us and to keep enough time to explore, we are 7 people with 5 adults and 2 teenagers then order 5 “nasi goreng” and 2 fried noodle. We awaiting for quiet long to have our food ready. After awaiting 1 and half hour, our food are ready. Unfortunately, the “nasi goring” not like what we expect. The rice to hard and too dry, the price also too expensive. IDR. 20,000 per plat. The taste as well not tasty and far from the delicious. Not worth for the value of money. But we have to eat something to have an energy to explore the island, which for sure will take much of our power and energy to explore and riding a motorbike. Upon finish the food, we are ready riding a motorbike to exploring the island. We start to Jungut batu about 13.13. We ride the motorbike slowly. The speed only about 30 to 35 kilometers per hour. Quiet slow. 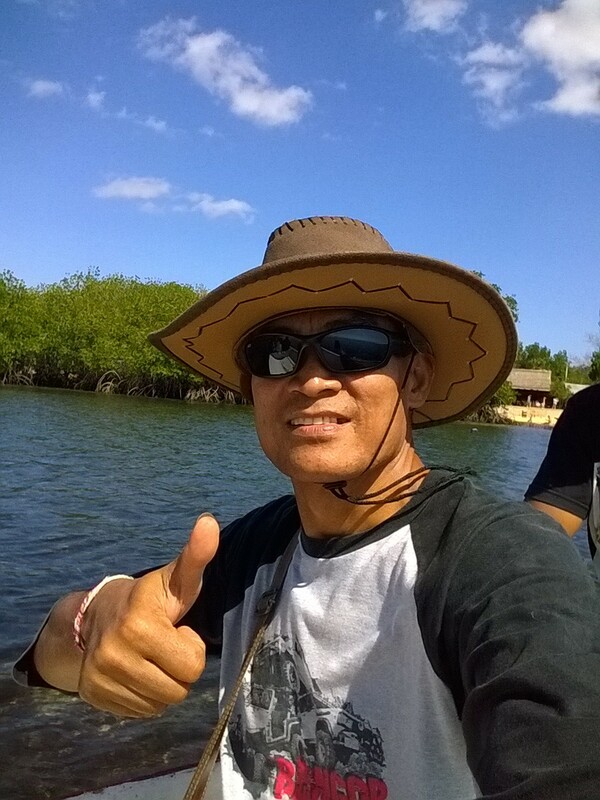 First thing, we will visit the mangrove forest in Jungut Batu village, about 25 minutes from Mushroom Bay. The road in dusty and the sun is very bright, quiet hot, but does not make our skin feel hot, it is because of the humidity is quiet high. 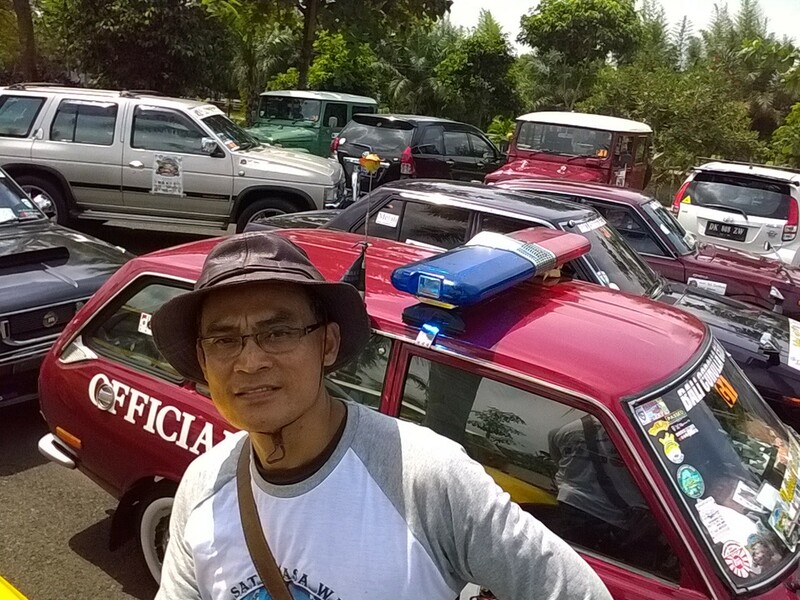 We ride about 30 to 40 kilometers per hour while enjoy the view and the road and as well the village situation. A long the way to Jungut Batu, we found a lot of pub and mini restaurant which prepare some food for lunch or for coffee only. The pub are good and seem clean and homey, which I believe will make us feel comfort to has a food or just had a cup of coffee. Most of the food are seafood like a snapper or prawn, Tuna fish and lobster. We will trying the food in one of these pub if we have a time after the journey completed. We passing many tourist who most of them are foreigner, like Switzerland, Netherland, Russian, Australian, Chinesse, Korean and a few of Japanese. Their face are so happy and enjoying the island a lot. They also riding a motorbike to explore the island, do a water sport like snorkeling, diving and cannoing, and also surfing. But some of them with more budget, they rent a buggy electric cars, beside also ATV and a jeep. But only a few. Most of them are rode a motorbike. Beside those vehicle, those who do not like driving or riding, there is a pick up with a seat which can bringing 15 people to the journey. Usually they are from the same group from the travel agent. 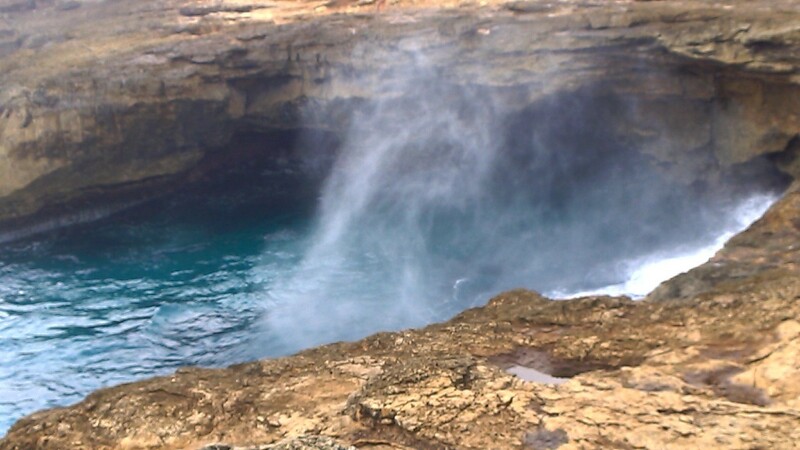 In this island, not all of the beach are suitable for swim or snorkeling, as there is also a dangerous beach with the clift and in addition the rock sharp is can fall suddenly. Therefore, we must always keep our steps when sight seeing especially to the rock clift. The view are beautiful, but we must always careful to avoid our holiday turn to the bad things. Especially when we do a selfie photo’s. Always ask you’re a companion to watch your steps and remind your own to always aware of the situation. 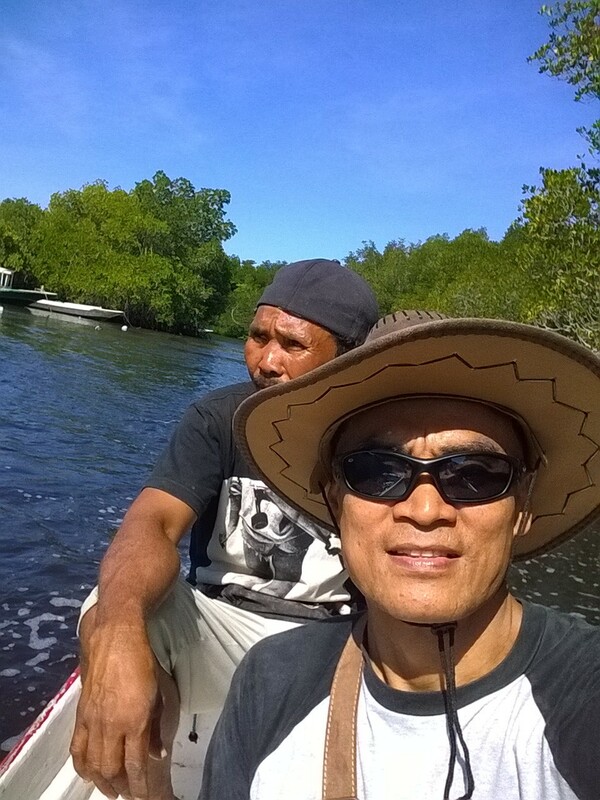 After riding about 25 minutes, we reached the mangrove forest in the south east of the island. There also a lot of café serve young coconut fruit which we can order to drink the water to satisfying our thirsty. 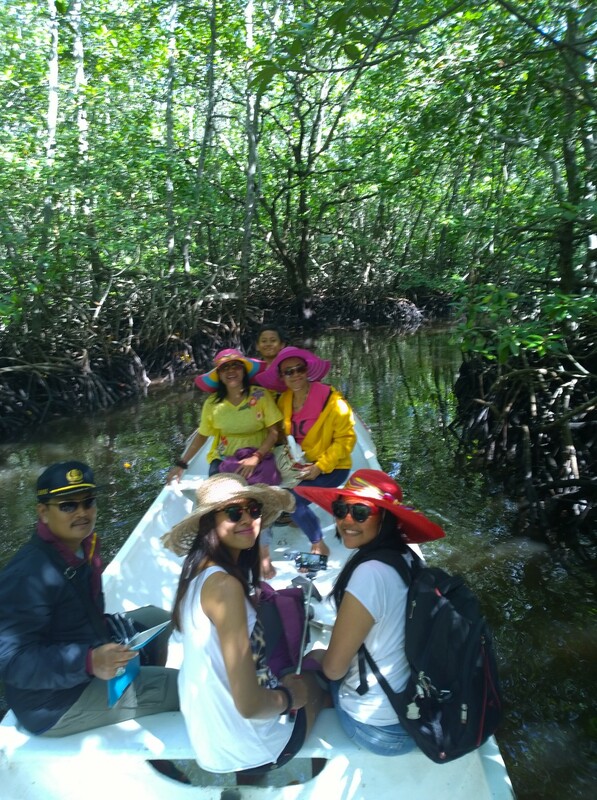 A guy came to us and offer the mangrove tour by “jukung “ a traditional canoe with Yamaha motor which can accommodate up to 15 people, with the cost IDR.25.000 per pax, but minimum for 4 pax or IDR. 100.000,- for one trip. We bargaining the price and finally we deal with IDR.150.000,- for 7 of us. So we are get in to the “jukung” and the guy pull the jukung to the deep water and start the engine to sailing to the sea and turn to the mangrove forest ahead. 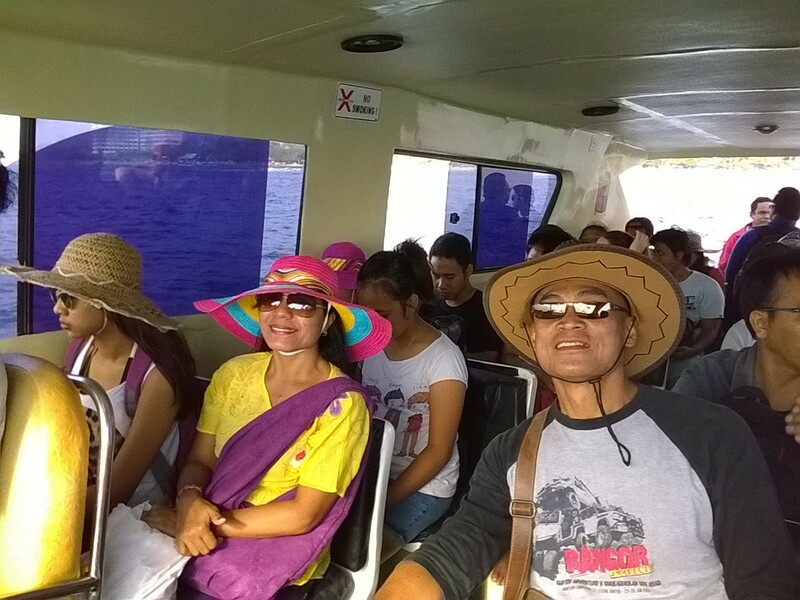 There is a canal route in the deep of the mangrove forest which use as a route of the tour. Come inside the forest, we can enjoy the green of the mangrove with many small bird singing up the trees. 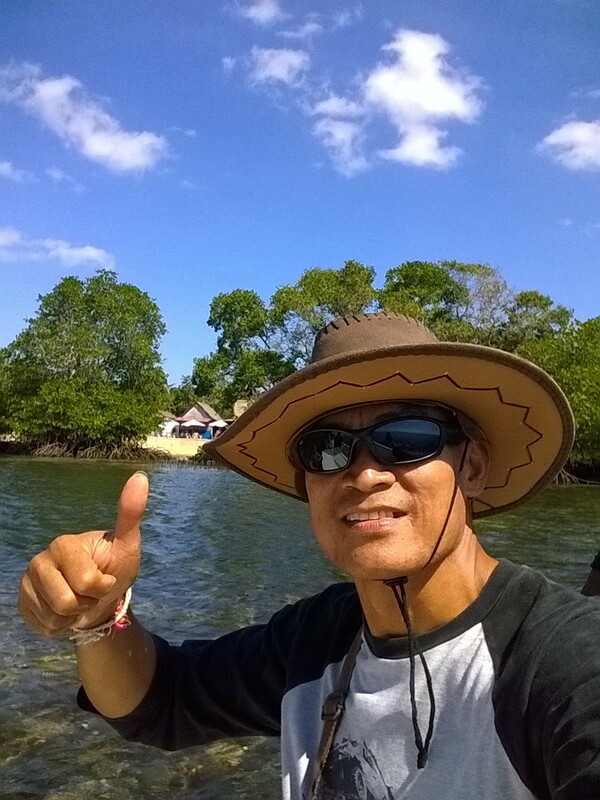 According to Mr. Wayan the guy who bringing us to the forest, there is a few kind of the birds live in the mangrove forest. They eat the plankton around the forest and be a part of the ecosystem of the live in the forest and in the end will kept the mangrove forest sustainable. And we must keep going the forest sustainable by not damaging the forest, not hunt the birds, not cutting the mangrove for whatever reason. 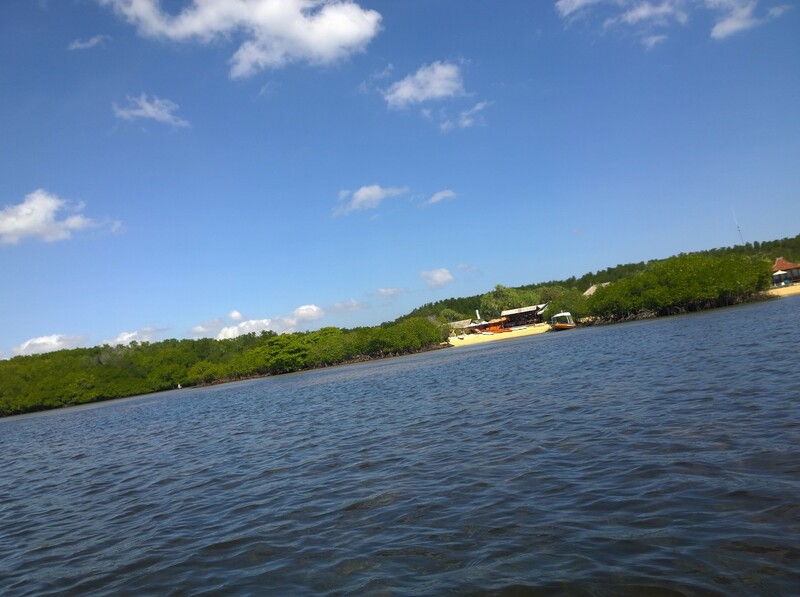 Once the mangrove forest damages, the sea water will hit the seaside and will abrasive and slowly the island will be destroyed step by step and in the end, the human who live in, will also in trouble. We follow the canal of the forest around. It is about 25 acres, but we could not entering to al of the forest as the canal are only limited, surrounded. The canals are naturally made. It is not people made, but by the Gods hands. We passed by some “jukung” from opposite as they do the mangrove tour earlier than us, Many domestic tourist are also visit. From their language and slang, I can guess they are from Jakarta and Surabaya. Most of them are a young people girl and a boy. They in a small group consists of 4 to 9 people, what like ours. “Ufffpp…. !” I am quiet surprising, there are 6 cannos came from our opposite. They are a Japanese with the guide. They talking quite loud and almost shouting. I talk with their guide and ask, why they ride canno to the forest. Their guide explain that they are not follow his advise, as they are play canno since early in the morning. They follow the canal back to the beach while talking each other in loud, even almost shouting. We almost complete the tour and reached the end of the canal, where we must turn and back track to the beach. The tour completed about an hour. We reach the beach by 15.21 local time and spent our time to seat and enjoy the young coconut fruit while talking about the tour we just has, and watching the people who come and out in the beach. The café quiet busy by the Chinese guests group. They use almost all of the seat to eat the snack and the drink of young coconut and some of them also drank the beers. 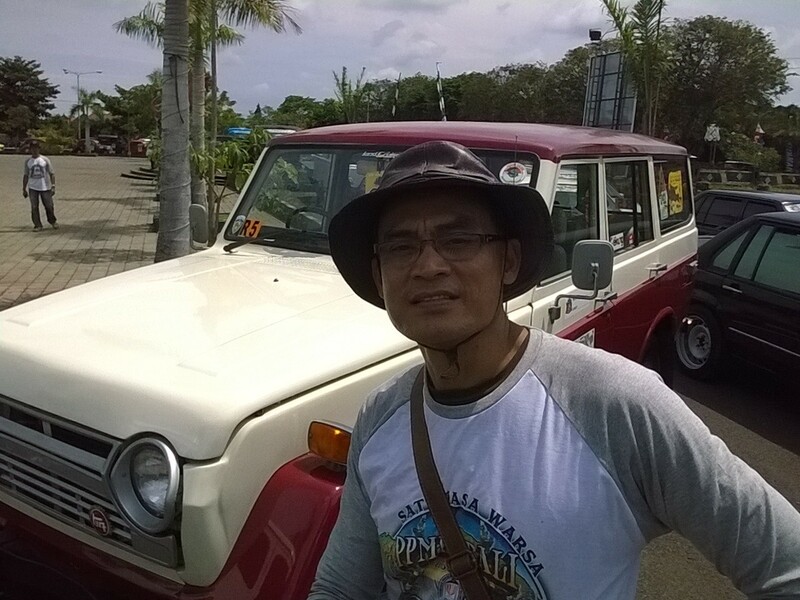 And we ready to explore the Ceningan Island, which located not so far. Ceningan island is a very small island with about 25 acres of wide. The main island of Lembongan and Ceningan Island combine by the yellow bridge which can be passing by only one motorbike in the same time and must queing one by one. From mangrove in Jungut Batu, we riding a motorbike about 15 minutes and we can see the yellow bridge which is about 300 meters long crossing the sea which no water. The sea sand only. The sea is use to drying the sewage. There are a lot of the people drying a sewage. I tried to know what is the sewage for and get inform that the sewage will export to overseas, usually to Japan for the based of the medicine or make up. We queing a while and get the turn to crossing the bridge. I am quiet worry as my motorbike feel not balance and many time I must use my foot to balancing the motorbike, while my wife shouting as she wore will fall down. Finally we crossing the bridge successfully and reach the Ceningan Island. We continue riding to the end of the road in the east of the island, where we can found the shelter for a farmer who collecting the sewage from the sea and prepare it for drying. We asking to the old women how and where we can found the Blue Lagoon Clift Jump, as my daughter wants to see those popular and famous point. We then follow the direction we got from those old women. The road to the that point very bumpy and dusty. Of course, all of the island is dusty as the water very difficult in this island. After passing bumpy dusty road, finally by 15.14 we reach the point at . And yes, the point call the Blue Lagoon Jump Clift because of the sea water in blue color and like a big lagoon and in the left side there is clift seem to jump to the sea. And in the middle there is a rock like atoll with long seem like a laying giant crocodile. 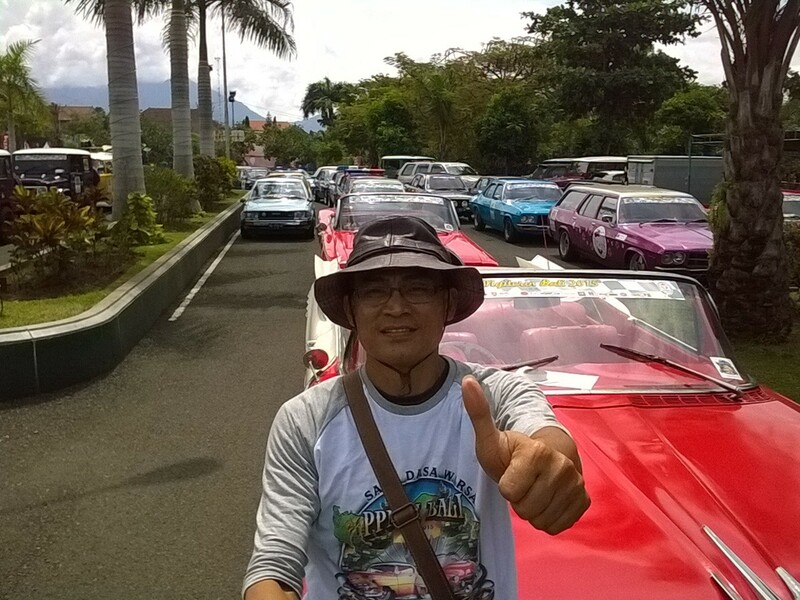 Hello all of my beloved da Trooper Bali friends… How are you…? I trust all of you enjoy the holiday and the long week end in this July. 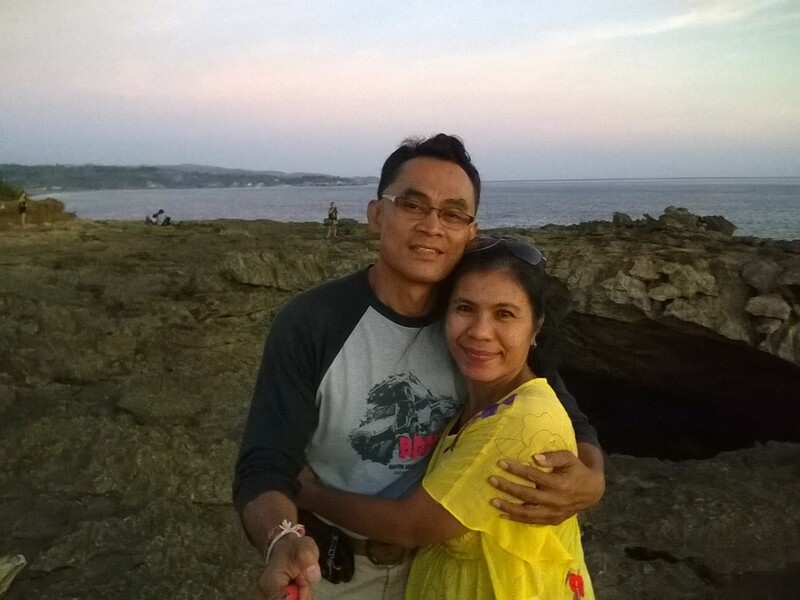 I love to share with you my holiday to adventure to Lembongan Island last week on 17 to 18 July 2015. Just two days and one night. It’s only a short holidays journey. But I enjoy and happy with this adventure. This is the first adventure, without my black da trooper. 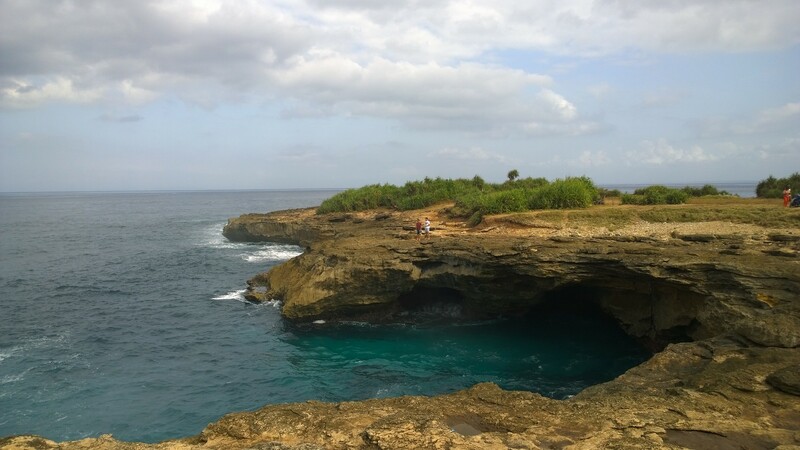 Last week on 17 – 18 July 2015 I spent my holiday in Lembongan Island a small island in the south east of Bali Island which is about 30 minutes destination by speed boat. I have planned my holiday to this island about a week before, so I have googling the island itself to know what about and how we can reach the island and of course with the cheaper cost and a maximum satisfaction. 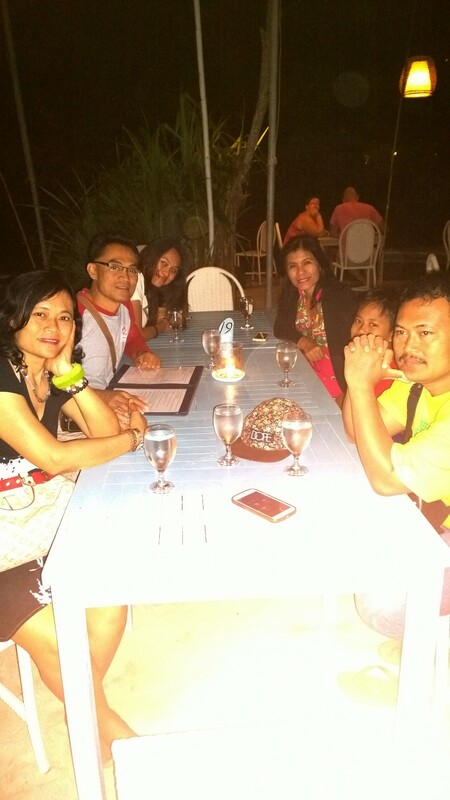 I went with my beloved wife, my daughter Dewinta , my younger sister and her family, so we are a small group of 7 people. And after some research and approaching some travel agent, finally I book two rooms thru Booking.com and choice the Daydream Bungalow at Tear’s Devil Street, located closed to the Dream Beach, Lembongan Island. I choice this bungalow after surfing and have a look many property in the internet and seem this bungalow much comfort for both of us with 7 pax with a reasonable price. 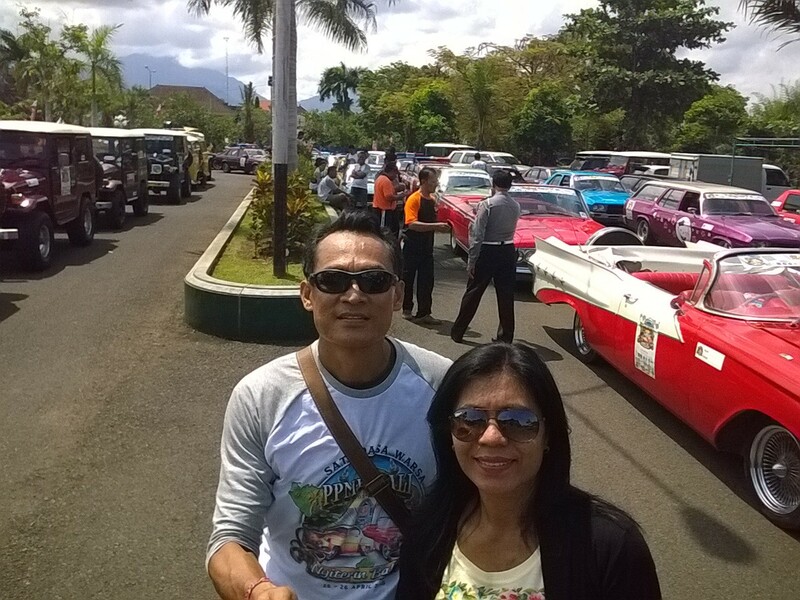 As per scheduled, on 17 July 2015 early in the morning at 7.30 Bali time we came to Sanur to buy a ticket speed boat to transfer us to the Lembongan Island. We arrived in Sanur by 8.15, and in a hurry find the ticket box, but unfortunately most of the ticket is sold out which is according to the guy there, have sold early in the morning as the passenger came to the ticket box since very early at 5.30. Yes of course, this a long week end and furthermore, this is Lebaran holiday after a Hindu holly days of Galungan. 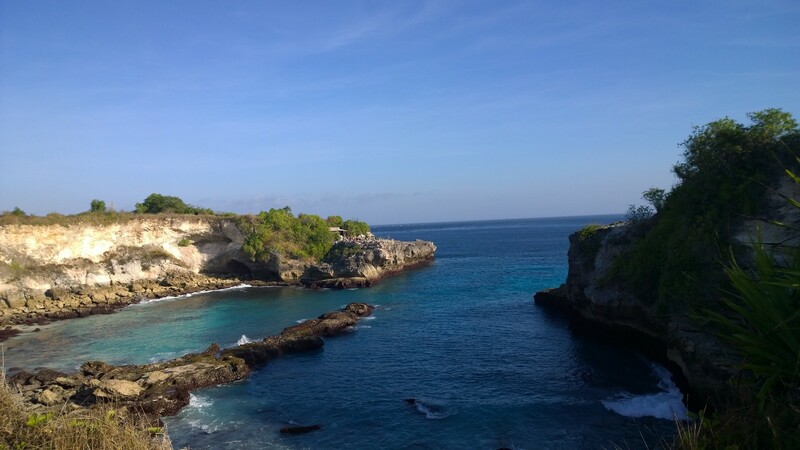 I forget about that, but to be honest, I am not realized that now a days Lembongan Island become a popular and famous destination for short holiday. I just realized that there were so many people love to spend their holiday in Lembongan those small island. I have been there about a few years a go, and on that time there is not so many people came to the island and as well not so many of the bungalows or the accommodation are available. Simply to say, there is very limited rooms available and limited activity for the tourist, except for the water sport like cannoing, Snorkeling, Sea walker, Bottom glasses, banana boat and other water sport activity. But now, as we can heard and see from the internet, there are a lot of rooms available, with various price according to the facility and the location. Beside, there are also a lot of the guest houses and the private room that rents for the visitors with limited budget are available. One of the guy in that ticket box telling me to come to another ticket box next door, located about not so far from the first ticket box. And in a hurry I go to the another ticket box by walk and about 400 meters and from about 200 meter of my vision, I saw that there are so many people queing to buy ticket. I join with them and waiting the turn to serve, but the ticket on the second trip of 8.30 has sold out and have to wait for the next trip, but the ticket box staff still not allow me to buy the ticket for the next trip and will serve after the second trip boat start the trip. 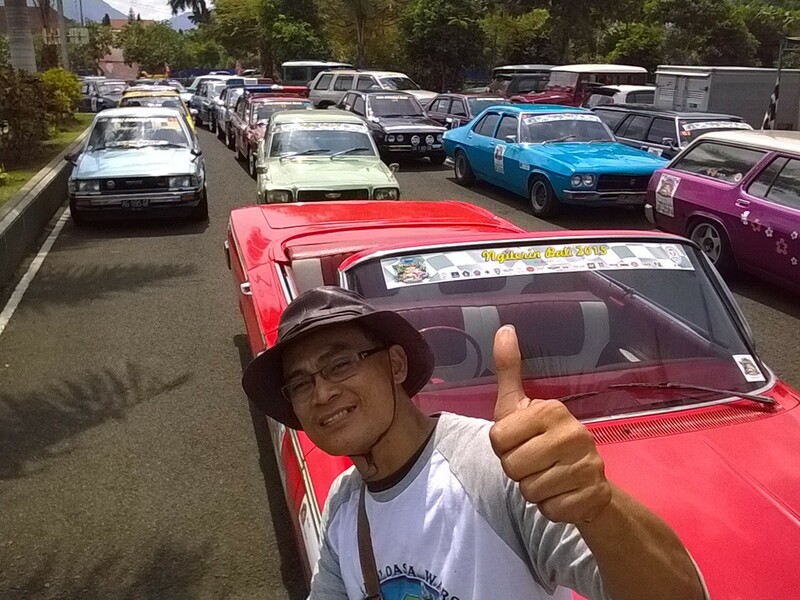 I pay the ticket for 7 pax and waiting for the next rip scheduled by 9.30 Bali time. We are awaiting for the trip and seat in the nearest beach. The boat will departure by 9.30 and will take about 30 minutes to arrive in the Mushroom beach. Lucky us, the boat start earlier and by 8.45 Bali time, the announcer inform us to boarding as the boat ready. We get in to the boat in wet as we must down to the sea water to reach the boat. I get the front row seat, just closed to the front window, so I can see the water in front of the boat. After all of the passenger seat down on their seats which are 40 seat, the boat start move forward to the deep sea by the boat’s staff and after the boat in position, the engine turn on and trip began. The tide not so high and the sky was clear in blue sky, the wind also very soft. It must be a nice trip in the sea. 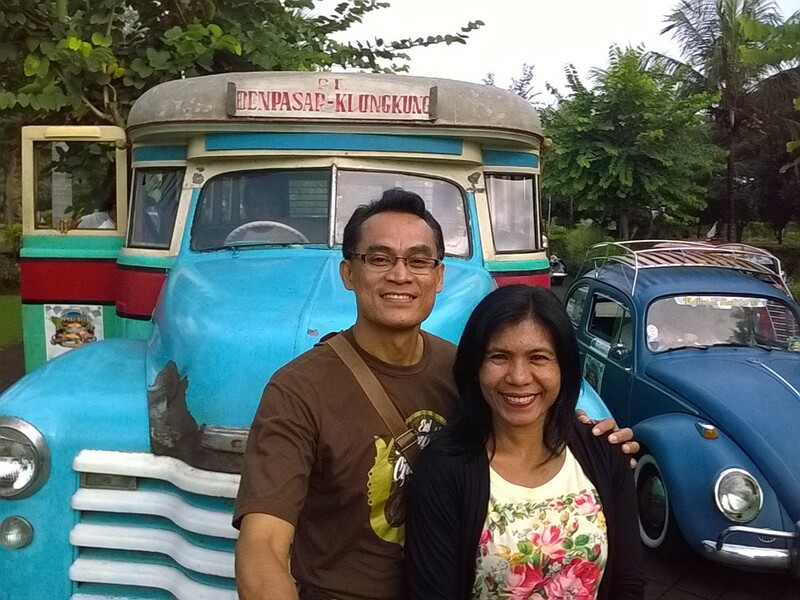 We pray to the lord to guide us and keep us in good journey sailing to the sea to Lembongan Island. In the middle of the sea, the boat start to jump and suddenly down and jump again make all of the passenger quiet worry and some of them start to shout and some of them are enjoy with those and laughing loudly while their hands grab the shoulder of the seat. I try to take a picture in the quack and got some good picture. While in front the captain is busy with the steering wheel to control the direction of the boat. I see the speedometer and realized that the boat go quiet fast almost use all of the engine power. The speed about 9 to 10 knots per hour. Very fast…! In the middle of the Strait of Bali just see the sea water and sometime seagull in the front of the boat and fly above. It could be searching the fish to eat. My wife and my daughter and almost all of the passenger are shouting loudly every time the boat jump and down to the surface of the sea with the “bretak krekk” and “gedubrak rrrtek” sound continuously. The sound came from the beat between the deck of the boat and the water when it jump and down. After about 30 minutes sailing, the speed reduced and sailing slowly closed to he island. I stand up from the seat and see to the front and saw the island now closer and closer. There are many boat and small “jukung” or kayak and also canoe are stand by and tied and trunked on the beach. The sand are white but not so wide like in Kuta or Nusa Dua or Sanur beach. Of course isn’t, the Island only a small island. Behind the sand there is a rock with stepping stair to the pathway. 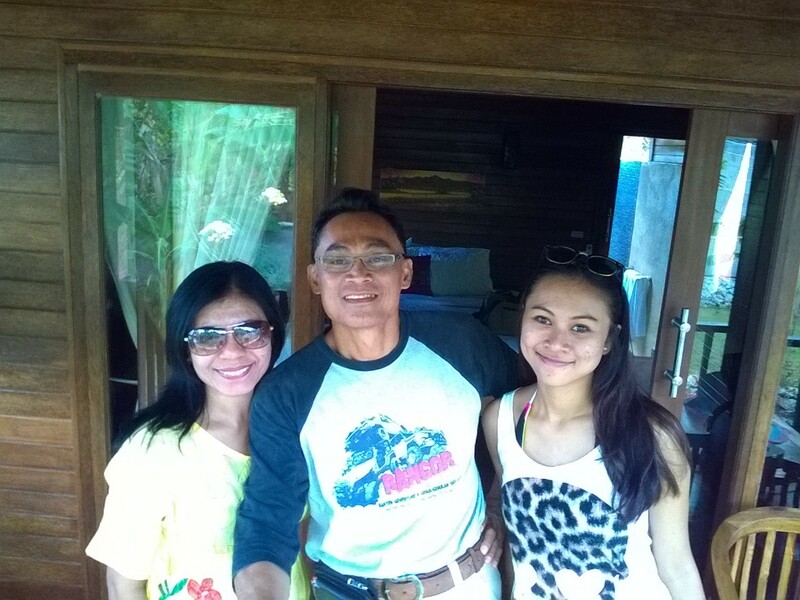 We are arrive in the Mushroom beach, Lembongan Island by 10.05 Bali time. The whether are warm and the wind also nice, the sky are very bright. The water very clear as wew can see the coral and the small small fish in the based of the sea with white sand. It is the best time to sight seeing around the island. The staff of the boat throwing the anchor to hold the boat not to tow by the tide. The boat now turn to redirect the back of the boat to the sand beach. The captain down to the sandy beach and the staff helping the passenger to get down to the island. As I and my family seat down in the front row, then have the last chance to get down to the island. I collect my luggage, only one back pack and one travel bag bringing a pieces of cloth of my wife, while my daughter bring her belonging only one back pack and of course her gadget. We climbing to the step stairway to the island. And one of the local people offer me to rent a motorbike. 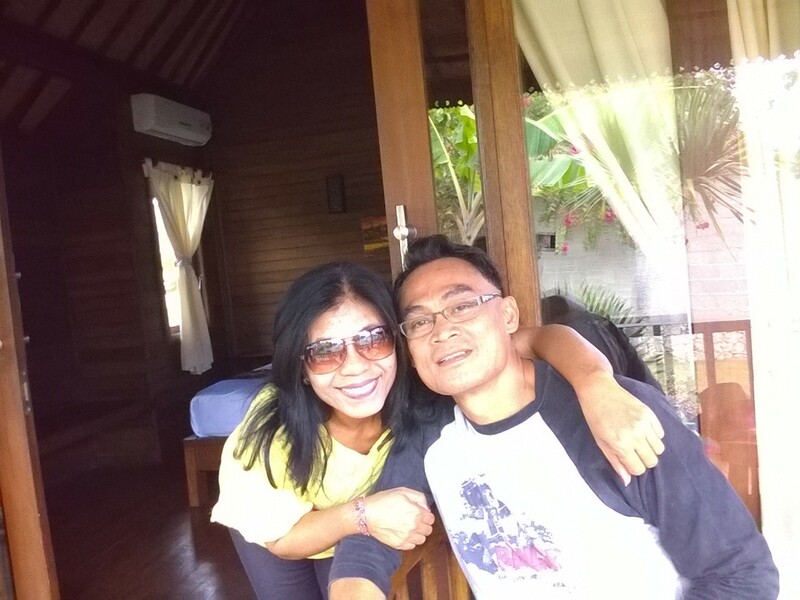 He inform me about our accommodation which not so far from the beach. It is about 3 kilometers, but he advises to riding a motor bike so we can explore the land faster and more enjoyable. Only 5 minutes, we found our accommodation during in the island. It is DayDream Bungalow, in the Tear’s Devil Street, located closed to the Dream Beach in the west side of the island. 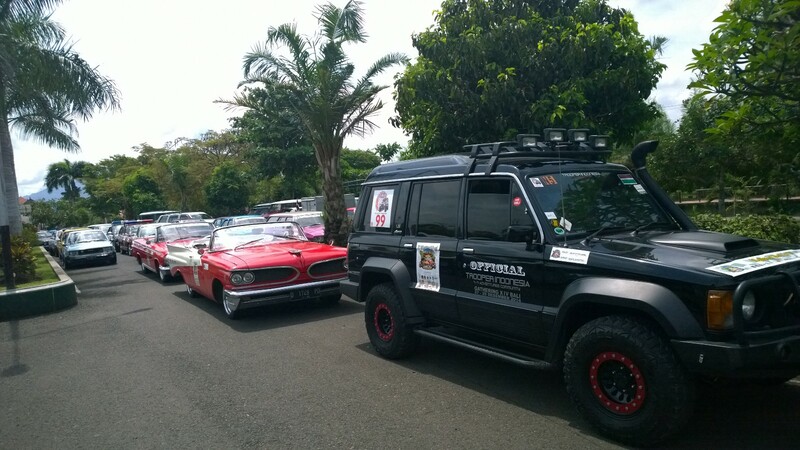 We checked in and get a glass of welcome drink to waive our thirsty after the sailing the Strait of Bali. We wait for the room to be vacant and ready. While awaiting the room ready, I sightseeing to the around of the bungalow. The bungalow only has 5 bungalows, built from the coconut trees wood and finished with teak oil in natural color. They built like a hanging wood houses, with the space between the land and the floor of the bungalow about 70 centimeters spaces, with 5 step stair up. The land area only about 1,000 square meters, not that wide. It has a small garden with some of bougenvile and Balinese frangipani for the highest trees and some various of landscape grass and other plant to cover the land. The palm trees planted in certain point which just growth. Seem this bungalow still new or not more than 2 years built. There is also a splash pool which we can use to swim or just to cooling our body after exploring this exotic small island. There also 6 sunbathing long chairs with umbrella. The have no lobby for check in, but they have a help desk and 3 table with 4 seats for each table to had a food or just for breakfast. They have a limited food variety in this bungalow, they have only Fried rice or nasi goreng, pancake and a sandwhich, but there is a near great restaurant in the Sandy Bay Beach only 5 minutes by walk. After waiting for about 40 minutes, the rooms is ready and the staff host us to the room. The room quiet wide and furnish properly with a king sized bed with a comfort sheet, soft nice pillow and blanked. No television, no minibar. The fix table a joined with the wall and made from the coconut wood. The ceiling covered by knitted bamboo and finishing by varnish which make the room a natural touch. Selamat pagi semua pembaca “da Trooper Bali”. dalam rangka memperingati hari jadinya yang ke 10. 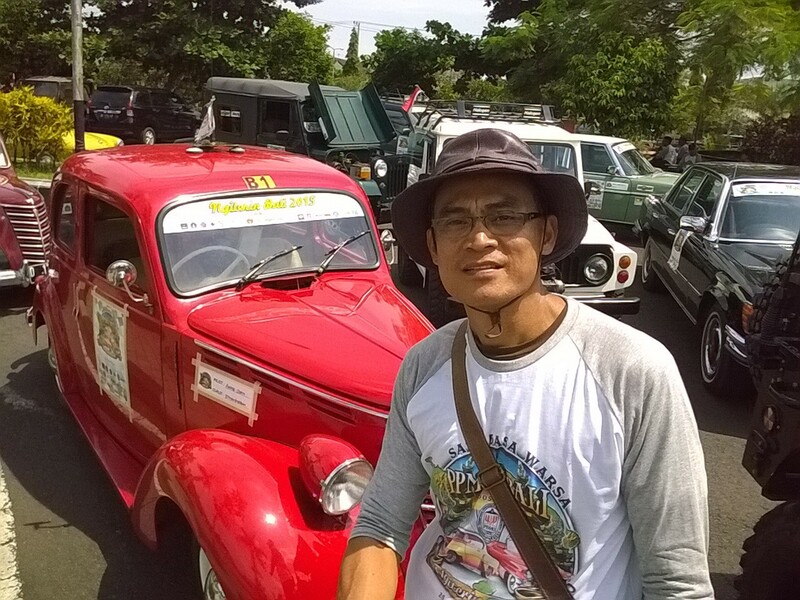 Turing dengan titel “Ngiterin Bali 2015”. Ngiterin dari Bahasa Bali artinya memutari. Jadi Ngiterin Bali maknanya adalah memutari Pulau Bali. 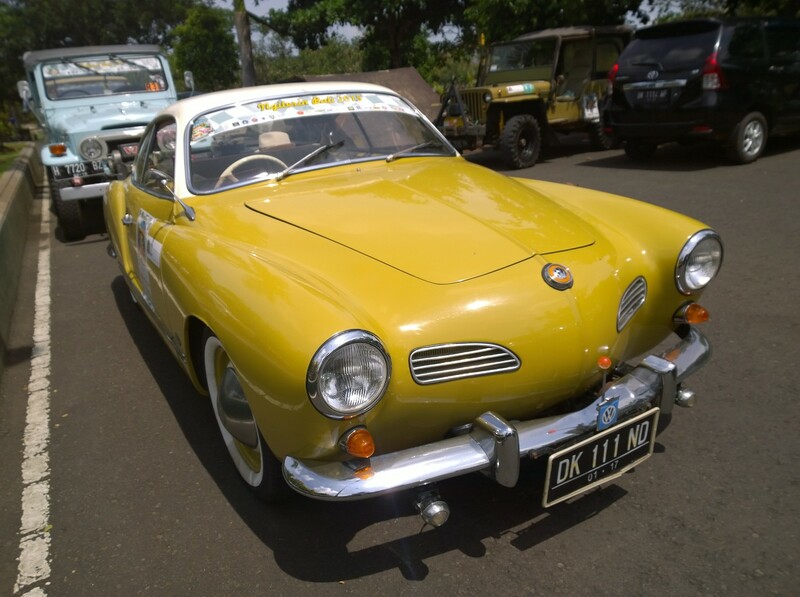 PPMKI atau Perhimpunan Penggemar Mobil Kuno Indonesia merupakan club pencinta otomotive (Mobil) Kuno yang telah cukup lama keberadaannya. Di Bali sendiri anggota PPMKI cukup banyak yang tersebar di berbagai daerah di Bali, namun terbanyak berada di Denpasar, Gianyar, Tabanan dan Klungkung. 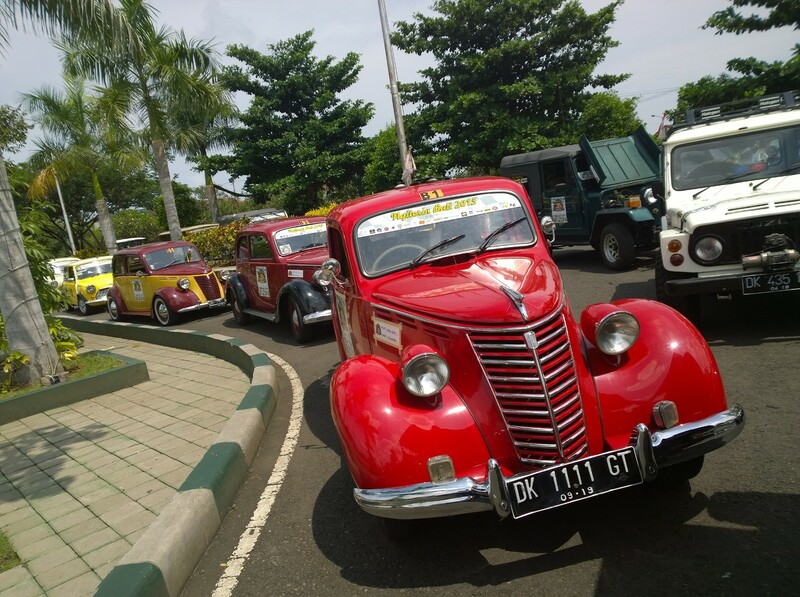 Animo masyarakat penggemar otomotive cukup tnggi untuk mengikuti gelaran turing ini. 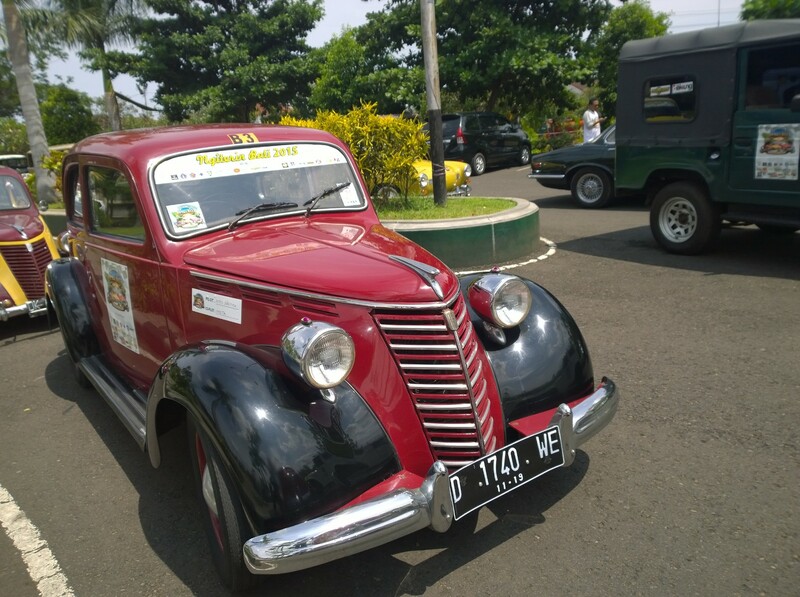 Tercatat 167 mobil dari berbagai merek yang turut hadir memeriahkan turing ini. Begitupun saya dan si Hitam, sangat antusias mengikuti acara ini, meskipun agak sedikit memaksakan diri mengingat saya dalam beberapa bulan terakhir ini agak kecapaian mengikuti berbagai acara dan kegiatan social lainnya. Beruntung, cuti yang saya ajukan sangat mendadak disetujui oleh atasan di kantor, dan sepulang kantor setelah mengikuti pertemuan dengan Pengurus Asosiasi Profesi yang saya ikuti yang kebetulan dilaksanakan petang hari mulai pukul 19.00 WITA dan berakhir pukul 21.00 WITA. Sepulang dari pertemuan dengan pengurus Asosiasi saya juga harus menghadiri pertemuan dengan teman-teman lama di komunitas Alumni SMA dulu yang akan mengadakan kunjungan social ke Panti Asuhan pada hari Minggu tanggal 26 April nanti. Setibanya di secretariat, pertemuan sahabat alumni ternyata telah bubar, hanya tinggal tuan rumah dan 2 orang sahabat. Setelah ngobrol beberapa menit, akhirnya saya dan dua teman berpamitan mengingat malam semakin larut. Sudah pukul 11.00 malam. Malam itu saya langsung mengarahkan si Hitam ke bengkel sahabat saya untuk mengambil stiker turing PPMKI agar bisa dipasang di Si Hitam, mengingat esok hari pukul 6.30 kami sudah harus registrasi ulang di Panitia. Setelah mengambil stiker, saya langsung mengarahkan si Hitam untuk pulang ke rumah, agar cukup waktu untuk memasang stiker dan beberapa pernak pernik lainnya di badan si Hitam. Dengan usaha yang cukup berat, akhirnya stiker PPMKI Ngiterin Bali dan beberapa stiker lainnya berhasil terpasang di bodi si Hitam. Saya baru bisa istirahat dan tidur pukul 01.00 tengah malam, setelah sebelumnya mengaktifkan alarm agar besok pagi tidak bangun kesiangan. Pukul 04.30 WITA saya terbangun karena si Sunny anjing saya ribut. Saya membuka pintu dan keluar untuk melihat apa yang membuat dia ribut. Ternyata seekor anak kucing tampak meringkuk ketakutan di bawah kursi. Saya panggil si Sunny dan mengajaknnya masuk ke dalam, agar saya bisa mengambil anak kucing itu dan membawanya keatas tembok agar jauh dari jangkauan si gukguk. Akhirnya, saya tidak bisa melanjutkan tidur lagi, dan segera mandi dan memasukkan barang bawaan ke dalam mobil. Mulai pakaian ganti, camilan tool kit dan beberapa pernak pernik lainnya. Pukul 6.00 saya dan istri sudah siap. Kami bersembahyang bersama kemudian pamitan ke anak perempuan kami dan meluncur ke Puspem Badung di Sempidi. Pukul 6.30 WITA kami tiba di Puspem Badung. Start pelepasan peserta pertama akan dimulai pukul 7.30 WITA. Setelah ceremonial dan pengarahan dari Kapolda Bali, Bupati Badung dan penyerahan cendera mata, tepat pukul 8.00 WITA peserta kelompok pertama yang terdiri dari mobil-mobil kuno dilepas oleh Bupati Badung. Rute yang ditempuh sejauh 400 km dengan tujuan pertama adalah Ibu kota Jemberana dan akan makan siang di Twin Tower kebanggaan masyarakat Kota Negara. Setelah makan siang turing lanjut kearah arah Gilimanuk yang merupakan ujung barat pulau Bali, dan masuk ke jalan ke arah Singaraja memeneruskan perjalanan ke bekas pelabuhan Buleleng di pantai Pabean, Buleleng. Peringatan ULang Tahun Ke sepuluh PPMKI akan dipusatkan di Pantai Pabean BUleleng. Peringatan Ulang Tahun PPMKI Bali yang ke 10 dengan pemotongan tumpeng oleh Ketua umum PPMKI yang juga ketua PPMKI Bali Bapak Yos dan akan dihibur oleh band The Hydrant yang tersohor di Bali dan di Eropa. Rombongan akan menginap semalam di Pantai Pabean ini. Sebagain peserta akan memang tenda dan sebagain menginap di Hotel POP yang berada dipinggir pantai Pabean. Acara di buka pukul 19.00 dengan doa bersama, pemotongan tumpeng dan makan malam barbeque bersama seluruh peserta dengan menu ikan bakar, ayam bakar dan pepes ikan tuna dengansayur plecing kangkung yang nikmat, karena makan malam disertai suara debur ombak pantai. Sungguh nikmat rasanya. Setelah makan malam, panggung dibuka oleh band pembuka dari band asli Singaraja dengan 4 buah lagu dari the Beatles. Dan puncaknya the Hydrant menghibur peserta dengan gaya khasnya yang cool dan vocal serta aksi panggungnya yang luar biasa. Peserta sangat puas dengan makan malam dan hiburan musik oleh the Hydrant. Pukul 23.00 WITA acara hiburan music oleh band the Hydrant selesai dan peserta berisitirahat. Esok paginya, peserta diajak bakti social membersihkan pantai Pabean. Pantai Pabean sangat kotor karena sampah kiriman dari beberapa sungai. 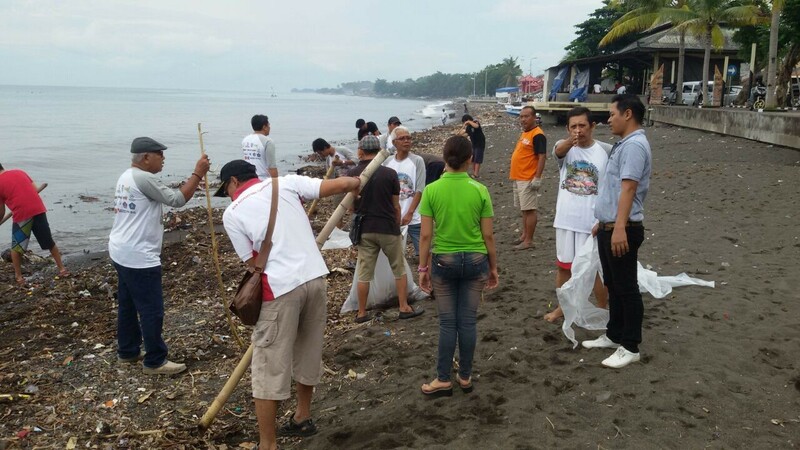 Sampah berat seperti batang pohon, plastic bahkan pakaian bekas dan jaket yang berat ikut terdampar di pinggir pantai, membuat pantai jadi terlihat kumuh. Untuk membersihkan sampah itu menjadi sangat berat karena banyak dan beratnya sampah sampah tersebut. Kami mengupayakan mengangkat sampah yang berat tersebut. Karena waktu yang terbatas, akhirnya kerja bakti diakhiri pukul 9.45 WITA karena peserta harus bergerak ke Karangasem pukul 10.00 untuk mengejar waktu agar bisa tiba di Karangasem sekitar pukul 17.00 WITA.